Nearly two-thirds of Americans say the mainstream press is full of fake news, a sentiment that is held by a majority of voters across the ideological spectrum. According to data from the latest Harvard-Harris poll, which was provided exclusively to The Hill, 65 percent of voters believe there is a lot of fake news in the mainstream media. That number includes 80 percent of Republicans, 60 percent of independents and 53 percent of Democrats. Eighty-four percent of voters said it is hard to know what news to believe online. President Trump has railed against the “fake news” media, casting the press as the “opposition party” and opening the White House to once-fringe outlets, to the frustration of the mainstream press. The president’s critics have accused him of using the “fake news” moniker for any story that casts him in a negative light. Many conservatives believe the media has dramatically loosened its reporting standards when it comes to Trump, taking an anything-goes approach and running with anonymously sourced material that it would never print about a more traditional Republican or Democratic administration. A cottage industry of conservative media critics has sprung up online to draw attention to the salacious details about Trump that spread across social media or are aggregated countless times before they’re revealed to be mischaracterized or untrue. The net affect is that Trump’s image, and public trust in the media, are at all-time lows. Trump’s job approval rating is at 45 percent approval and 55 percent disapproval in the latest Harvard-Harris survey. Gallup’s annual survey on public trust in the media — conducted before the election — found that only 32 percent trusted the press. However, the Harvard-Harris survey found that 60 percent of all voters believe Trump is treating the press unfairly. Only 48 percent said the media is treating Trump unfairly. “Voters show concern about direct attacks on the media by the president even when they have questions about it,” Penn said. The Trump administration has been dogged by an unprecedented string of government leaks in recent weeks that have played out in the major newspapers, including media stories about the president asking fired FBI Director James Comey to pull back from an investigation and another about how he revealed classified information about a terrorist plot to Russian diplomats during an Oval Office meeting. At hearings on Capitol Hill on Tuesday, former CIA director John Brennan and director of national intelligence Dan Coats expressed deep concerns with the leaks, which were printed in the New York Times and Washington Post, respectively. Seventy-four percent of voters say the leaks are a serious matter that should be investigated, including 84 percent of Democrats. However, 62 percent say that journalistic organizations that publish information — even if it is received illegally, through hacking — should be protected by law. “It is very clear in the poll that overwhelming majorities of the country take leaks and potential political unmasking of members of the Trump campaign in wiretapped conversations merit full and even independent investigation,” Penn said. The Harvard-Harris online survey of 2,006 registered voters was conducted between May 17 and May 20. The partisan breakdown is 36 percent Democrat, 32 percent Republican, 29 percent independent and 3 percent other. The poll uses a methodology that doesn't produce a traditional margin of error. The Harvard–Harris Poll is a collaboration of the Harvard Center for American Political Studies and The Harris Poll. The Hill will be working with Harvard-Harris throughout 2017. Full poll results will be posted online later this week. אבל הוא הביא הסבר, אז לא נוריד אותו. 7. סקר: 65% סבורים שיש בפייק ניוז פייק ניוז..
הגיע הזמן שימציאו מילה חדשה. 28. ובצדק - שפה משנה מודעות ואם יש מישהו שמבין בזה זה איש העסקים טראמפ. לא לחינם הוא הדביק להילרי בכל הזדמנות את הכינוי crooked Hilary. כשאתה משתמש במונח פעמים רבות זה בסוף תופס ומשנה את הדרך שבה אתה מנתח את העולם. הבן אדם לא פחות מגאון בתחום הפסיכולוגיה המעשית. אובמה כמובן עולה עליו בכל פרמטר אחר של בירבורים-אינטלקטואלים-מנותקי-מציאות. 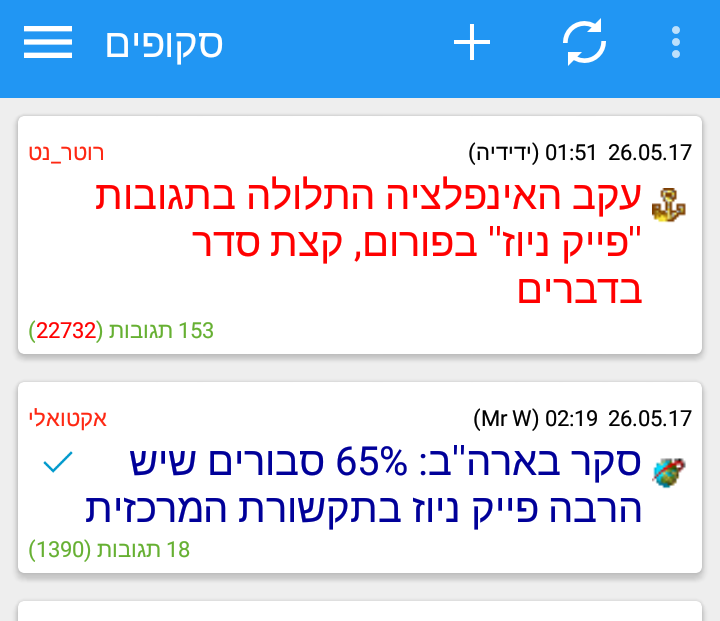 אפשר לדרג (חיובי)... אני לא נושך... מבטיח! 18. הם לא שמעו על ההגבלה החדשה כאן? 20. שמתם לב שכל מהדורות החדשות מתואמים בכל הדיווחים שלהם? אדם אחד מנהל את כל העסק הזה. אפילו הם מתואמים עם המפרסמים שימשכו את הפרסומות משון האניטי בגלל שהוא מנסה לחקור את הרצח של סת' קית. הם תומכים בחופש עיתונאי כל עוד זה תומך בצד שלהם. כולנו זוכרים כמה הם היו עצבניים ברגע שחשבו שטראמפ לא רוצה להכניס ערוץ מסויים לתדרוכים בבית הלבן,אבל פה הם מאיימים על מפרסמים (שאגב זה כבר מתנקם בחברות בגלל ביטולי מנויים) כדי להשתיק עיתונאי. 24. צריך לעשות כזה סקר בארץ, או שהם מפחדים מהתוצאות..
מן הפרספקטיבה הפרימיטיבית של תקופתנו קוראים לזה פייק ניוז. בעוד כמה שנים כשיתגלה חוק הטבע מספר 2 נבין שקוראים לזה תרבות. כל עדר מנסה לתמרן את ההמונים לתפיסות שלו. 26. לא מוכיח דבר על התקשורת. מוכיח את כוחה של שטיפת מוח. 27. אז פתאום אנחנו מאמינים לסקרים? יש עיוותים בסקרים, ולכן יש פערים תמוהים בסקרי שביעות הרצון של טראמפ, לעומת הסקרים האחידים והמדויקים בצרפת.